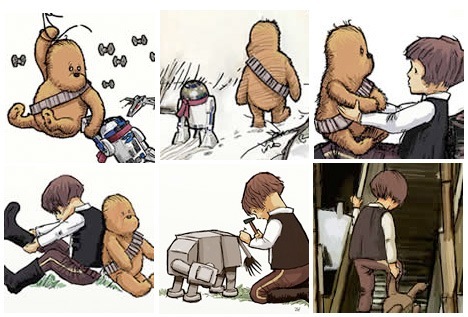 I've just discovered these lovely images by James Hance, that you can have as prints or printed on t-shirts, in which he depicts Han Solo as Christopher Robin, Chewbacca as Pooh Bear, R2D2 as Piglet, and an AT-AT as Eeyore. I think these are very cute and very well done. A perfect gift for the Star Wars fan who's now a parent, or maybe the Winnie the Pooh fan who's now become a Star Wars fan. Head on over to James's site and have a look at some of his other artwork. If you're a Muppet fan, you won't be disappointed.